Those keen readers of this blog will recall that one of the first items we bought was a washing machine. But as there are at least five laundries within a five minute walk from our apartment, we don’t bother washing our bed sheets at home. 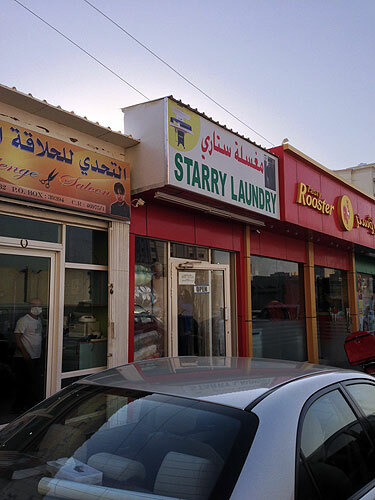 The nearest laundry is the ‘Starry’, just a fifty metre walk away. It is a narrow shop with a counter in the front. I guess the washing machines are behind, but all that can been seen through the doorway are three men with industrial irons pressing clothes all day long. Opening times are 7.30am until around 10pm daily except Friday when the open at 4pm, so it is both a long day and a long week. 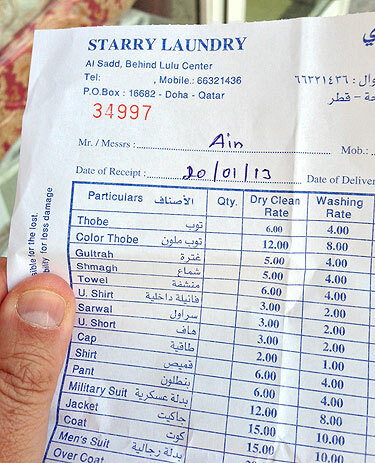 There is an Indian man on the counter who books in the laundry using a printed laundry list. He writes your name on the top of the sheet… he misheard my name, writing it as AIN. I am not sure how, but each time I come in he remembers my name and writes it incorrectly on the sheet. They did OK for the first wash… the sheets and pillow cases came back clean, pressed and folded. On the second wash, the duvet cover came back with a pinkish hue, so it went back to be rewashed and fortunately came back white. Due to the colour mishap I thought I’d try another establishment. This time the wash was clean but two pillow cases were missing. A few days later they said they had found them. I collected the package but when I got home, they clearly substituted another set. I am not too keen on second hand pillow cases so we disposed of them and I went back to Starry Laundry. I have now told them how to spell my name correctly. Another trip down the aisles at the Food Palace… and on the shelves above the freezer cabinets are rows of drinks. 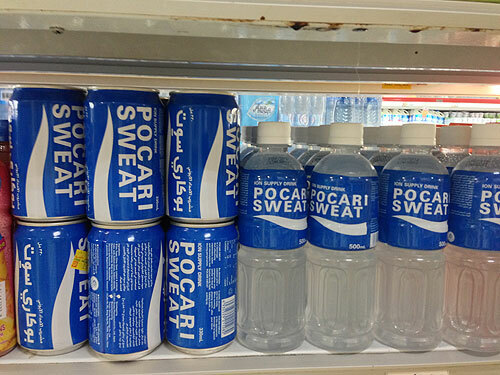 Available in either bottles of cans, Pocari Sweat is an unappetising name for this ‘Ion Supply Drink’. An ion is an atom or molecule that has a total number of electrons and protons that are not in balance, so the atom or molecule has a net positive or negative electrical charge. I am unclear what the benefits of consuming ions are… perhaps someone will enlighten me? Checking through the ingredients which is mainly water and citrus juice, but no ions, unless they’re in the sodium chloride, sodium citrate, malic acid, magnesium carbonate and a few other chemicals… but disappointingly there is definitely no sweat in there. Today my employer organised a ‘health fair’ at the 5-star Four Seasons hotel. There were stands all around the large room, each dealing with a different aspect of personal health. One of the stands was for blood donors. 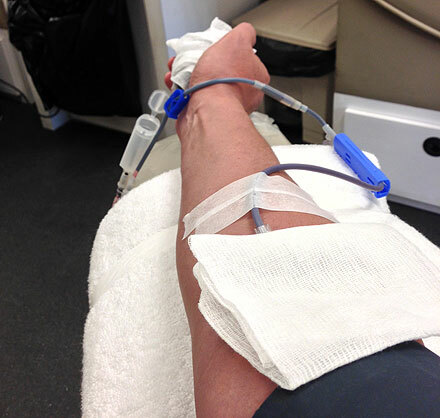 The last time I donated blood was around 1973 I recall not liking the bit right at the beginning where they prick your finger to test a small blood sample… so I didn’t go again. Knowing that medical science had moved on since then I sat down to talk to the guy manning the stand as I thought that maybe it was time to give again. There was some degree of altruism in giving blood as I want to put something back into the country that is providing me with a good lifestyle, but truthfully I only thought I was signing up to be a donor in the future. 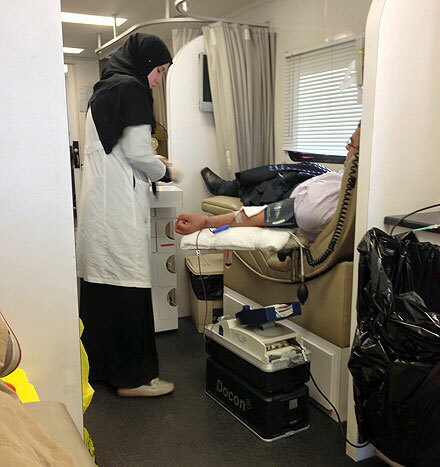 However within a few minutes I had completed the paperwork and two minutes later I was in the mobile blood centre being checked for suitability and blood pressure. With all the checks being completed and everything OK, I moved onto the couch and less that ten minutes later they had relieved my of 460 ml of vintage B+ into a small plastic bag. This is the second product in what I hope will become a regular feature showing strange and unusual items from the shelves or in this instance the freezer compartment of our local supermarket. These ‘Special’ squid balls come in two flavours… Plain or Hot and Spicy… the listed ingredients are obviously squid, but in addition flour, sugar, monosodium glutamate, chilli powder and spices, all moulded into a bite sized morsel. Neither variety is going to make the short trip to the checkout, back home and onto my dinner plate. But if these are your fancy, 3QR or around 50p makes for a cheap and possibly tasty meal. I guess they must be popular with the local Filipino population. 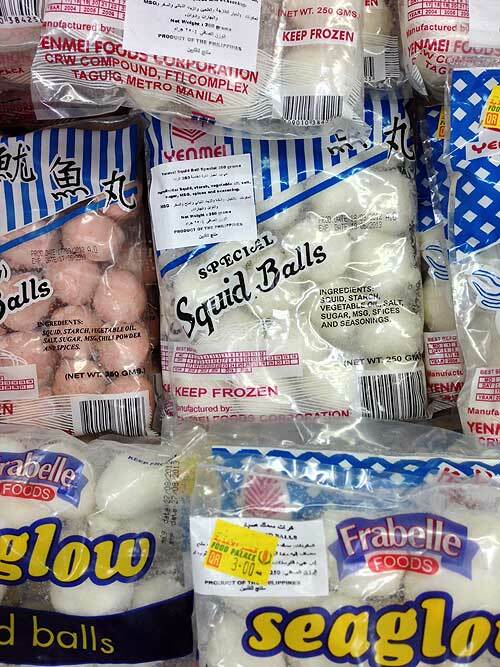 I am going to avoid any squid balls humour, but if you want to add your own squid balls joke please add to the comments below. Yesterday I took a day-return business trip to Dubai. For both legs of the journey, and for the very first time I wasn’t seated in the economy cabin, but way up front in the first class section. My first class ticket on Qatar Airways entitled me to their premium terminal for departure where complimentary breakfast, spa and other 5 star services were available. I enjoyed a light breakfast before joining the private minibus which took me and the other first class flyers to the aeroplane. The flight was all I expected. 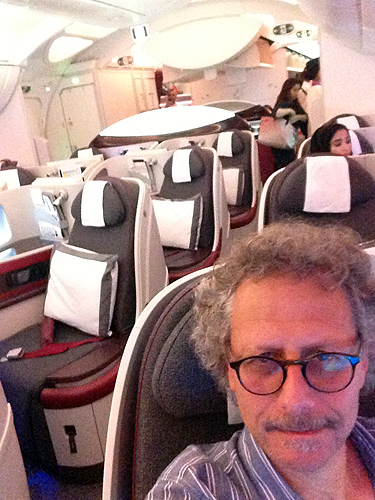 But it was not until the return flight that I really appreciated the comforts of premium travel as the plane was the new Boeing 787 Dreamliner. 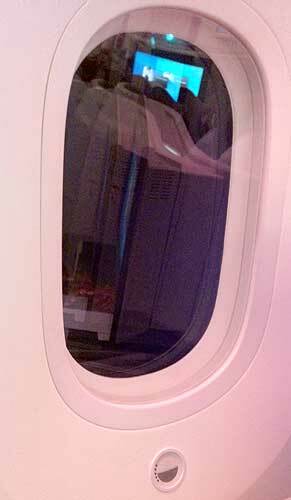 Apparently full of innovations, but the one that really excited me was that the windows didn’t have blinds but could be darkened at the push of a button on a touch screen next to the seat or by pressing the area beneath the window. I enjoyed a very edible ‘snack’ selected from a menu… not the economy “do you want the chicken or beef” question. 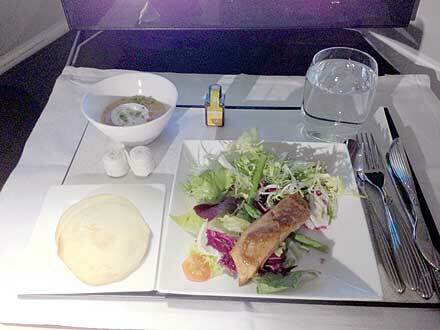 Air crew were attentive and friendly… I could really get used to this. In a postscript, newspapers are reporting a number of problems with the Dreamliner. Take the 16 minute drive from my apartment block in Al Sadd to the Museum of Islamic Art. Last night we went to the St Regis Hotel. The hotel is said to the best in the city. We ate at the ‘Gordon Ramsey’ OPAL restaurant. 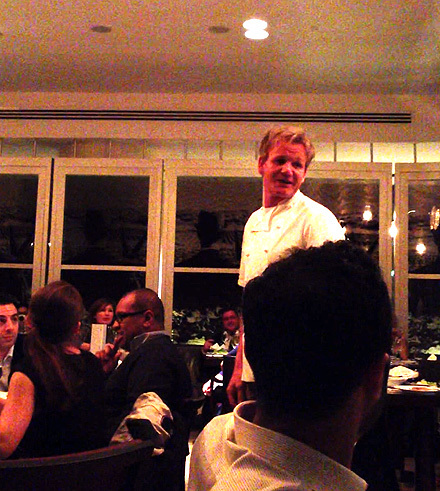 What made this dining experience different was that the meal was created and cooked by Mr Ramsey himself. Although the restaurant bears his name, I believe it was the first time he had been in Doha. We arrived at 8.30pm, to sit down at 9pm, rather closer to my bedtime than I would usually choose to eat. But as that was the only time available and we thought the experienced not to be missed. He appeared in the restaurant just as the first course was about to be served. A short speech and he was away, presumably to the kitchen. There were five starters, all bought to our table, followed by duck and finally by a pie. Unfortunately I forgot to photograph the menu so I can’t give you the fine details of all the ingredients. Although Gordon Ramsey said he’d return to talk to diners during the evening, he hadn’t appeared by the time we decided to leave. It was an excellent meal, not too expensive and compares favourably with some of the best meals I have eaten. Maybe it tasted better because it was a celebrity chef, or perhaps it was just a really fine meal.